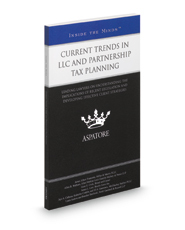 Current Trends in LLC and Partnership Tax Planning provides an authoritative, insider's perspective on understanding the impact of recent legislation on current and future planning opportunities. Experienced partners from law firms across the nation analyze key trends in the Net Investment Income Tax (NIIT) and explore the pros and cons of partnerships and LLCs. These top lawyers offer advice on developing strategies for succession planning, utilizing tax-free gifting programs, and applying tax increases to partnership based distributions. Covering a range of topics from addressing the challenges brought on by the American Taxpayer's Relief Act (ATRA) and the Affordable Care Act (ACA) to identifying ways of avoiding tax consequences in agreements, these experts discuss the effects of recent legislation on both individuals and corporations, as well as best practices for reducing the impact of increased rates on client strategies. The different niches represented and the breadth of perspectives presented enable readers to get inside some of the great legal minds of today, as these experienced lawyers offer up their thoughts on the keys to success within this dynamic legal field.